In searching through Youtube and many other free video sites Ghost filled videos real and fraudulent often fill our screens. In the center of all this is what many heald as the definitive show that in the oppinions of many is the proof that Sci-Fi's Ghost hunters Roto-Rooter plumbers Jason Hawes and Grant Wilson moonlight as ghostbusters for clients who claim to be experiencing reak paranormal phenomena. The show debuted in October 2004 on the American Sci-fi Channel. It should not be confused with the original 1996 Inca Productions show Ghosthunters produced for the Discovery Channel. The format was sold to the US to become Ghost Hunters. The only remaining link between the two shows is presenter Ian Cashmore who anchored the UK/Europe show. Cashmore piloted the U.S. show, but chose not to remain part of the US venture after he filmed the promos. Jason Hawes and Grant Wilson, along with other team members who belong to the group they founded, The Atlantic Paranormal Society (TAPS), investigate locations of interest by using electronic equipment which they feel is capable of detecting paranormal activity. TAPS's equipment includes digital thermometers, EMF (electromagnetic field) scanners, infrared and night vision cameras, handheld digital video cameras, digital audio recorders, and laptop computers. Other gear not shown on screen are an Ion Generator — a device that charges the air with electricity and theorized to help spirits manifest, and the White Noise Generator — an audio device that creates a static background noise and theorized to act as a catalyst for assisting entities in creating EVPs. Ghost Hunters has attracted various critics and skeptics. 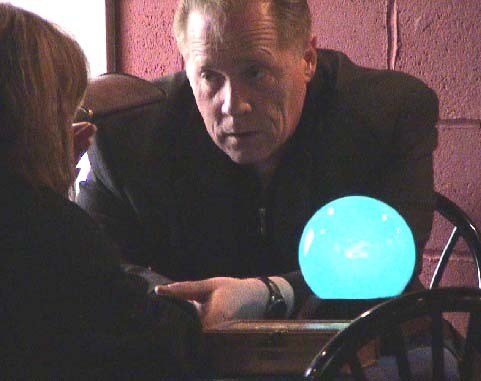 Some question the scientific validity of the investigations conducted by the TAPS team, its methodology, and particularly its use of instrumentation, as there is no scientifically-proven link between the existence of ghosts and (for example) cold spots or electromagnetic fields (which Hawes and Wilson say are not necessarily paranormal).Of ghost hunting in general, skeptical investigator Joe Nickell says, "...the approach of the typical ghost hunter—a nonscientist using equipment for a purpose for which it was not made and has not been shown to be effective—is sheer pseudoscience". Others contend that the show's claimed evidence of the paranormal could be easily hoaxed, since third party review of evidence collected by TAPS is not encouraged, and those who have contacted the group asking for full footage from everything recorded at the haunted locations have also gone unanswered. With each new season, critics of Ghost Hunters continue to publish skeptical analyses and theories on the Internet, often employing frame-by-frame analysis of episode footage which they believe debunks the show's findings. Like many reality shows, Ghost Hunters has developed some storylines which carry over from episode to episode. The phrase was subsequently printed on caps and t-shirts sold by the group’s merchandising arm. Harnois's storyline climaxed when he resigned from TAPS in episode 207. In the 2005 Halloween Special episode, he rejoined the group after asking leader Jason Hawes for a second chance. Technical Manager Steve Gonsalves is portrayed as reliable and unflappable, despite several phobias including fear of heights, spiders, and air travel. “ Wilson: "Why don't you try to show you have a sensitive side?" Hawes's character is depicted variously as authoritarian alpha-male (nicknamed "The Ghostfather") and devoted but irritable "parent." Wilson's character is shown as the milder of the two, more apt to avoid conflict with team members and to express support for Hawes's decisions. Other personalities on the TAPS team like newcomers Dustin Pari and Dave Tango are shown to contribute enthusiasm and occasional horseplay. In episode 213, Tango was apparently duped into wearing a rhinestone tiara during an investigation, while Pari is portrayed as technically knowledgable and eager to display his worth to the group. However, substantial storylines concerning these cast members have not been developed. A new spin off series Ghost Hunters International premiered Wednesday, January 9, 2008 and features TAPS veterans Robb Demarest, Andy Andrews, Brian Harnois, and Donna La Croix, along with Barry Fitzgerald (who appeared in the Ireland episodes of Ghost Hunters) and newcomer Shannon Sylvia. The format will be the same as Ghost Hunters but will feature investigations at locations mostly around Europe. Ghost Hunters producers Craig Pilligan and Tom Thayer released a new paranormal investigation series entitled UFO Hunters which first aired on January 30, 2008. The show follows New York Strange Phenomena Investigators (NY-SPI) co-founders Oliver Kemenczky and Ted Davis, along with paranormal researcher Dennis Anderson, as they investigate claims of alien encounters and UFO sightings. The format is similar to Ghost Hunters with most of the program dedicated to the investigation and wrapped up with a review of findings and evidence that was gathered. This series should not be confused with the History Channel series with the same name. In early 2007, The Sci-Fi Network delayed the airing of new Ghost Hunters episodes, creating a gap between new episodes of over six months. According to a network press release, six more episodes premiered starting in June 2007, with the premiere of an additional six episodes beginning on September 26, 2007. 2005 Halloween Special - aired October 31, 2005, TAPS went to Savannah, GA to investigate the Moon River Brewery and The Sorrel Weed House, a historic museum that conducts Savannah tours. 2006 Halloween Special - Ghost Hunters Live - aired October 31, 2006 at 11PM EST. It was a 6 hour broadcast originating from The Stanley Hotel in Estes Park, Colorado. ECW Superstar CM Punk joined the Ghost Hunters throughout the investigation. The viewing audience was able to interact with the team via PDA/cellphone text messages. 2007 Halloween Special - Ghost Hunters Live - aired October 31, 2007 at 9PM EST. It was a 6 hour broadcast originating from the Waverly Hills Sanatorium near Louisville, KY. Joining the team was guest ECW Superstar Elijah Burke. The episode was hosted by paranormal investigator Joshua Gates from the show Destination Truth who was stationed in an on-site "interactive center" which posted real time photos to SciFi.com. Also employed was a "Panic Button" message feature where viewers could alert the investigators of any strange happenings as they occurred. Simultaneously, SciFi.com ran an online poll for viewers to pick the new TAPS member chosen among three finalists, Patrick Clark, Mark Fusetti, and Deanna Hoffman. Mark Fusetti was revealed as the new TAPS member during the review of the Halloween Special on November 7th. Return to St. Augustine Light - aired January 9, 2008. TAPS conducted a special follow up investigation at St. Augustine Light in Florida. It aired before the premiere episode of Ghost Hunters International. The building featured at the end of the show's opening sequence and throughout the end credits along with a number of advertisements and other related materials is the Race Rock Lighthouse, which was investigated in the first season, viewed from the dock. The 2007 case in episode 'Shadow people' was also featured in an episode of the Discovery Channel's A Haunting. ^ Radford, Benjamin (2004-11-12). Reality Check: Ghost Hunters and ‘Ghost Detectors’. Committee for Skeptical Inquiry. Retrieved on 2007-03-22. ^ Nickell, Joe (2004-11-12). Investigative Files: Ghost Hunters. Committee for Skeptical Inquiry. ^ Smith, Alison. "TAPS vs. SAPS: The Atlantic Paranormal Society meets the Skeptical Analysis of the Paranormal Society", eSkeptic, The Skeptics Society, 2006-08-10. ISSN 1556-5696. ^ Sci Fi Channel (United States) (2007-03-21). "Ghost Hunters Returns to SciFi for Season Four" (pdf). Press release. Retrieved on 2007-03-22. ^ "Elijah Burke goes Ghost Hunting"
Real ghost caught on video! This collection of videos from the internet are thought by many to be positive proof that ghost exist. And by your many votes these are what you think are the top ten most haunted videos. Have You Got A Real Paranormal Video For others to Experience? Send us your true tales of strange, unexplained and paranormal videos . Send them to us for inclusion on this page. Americas' Best Haunted Ghost Tours in the United States . Voted by Reader submissions as "The Best or Most haunted Ghost Tour in America for you to take and to investigate.